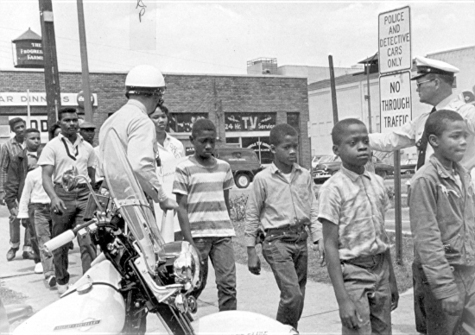 Innocent young men are marched to jail by racist police for protesting for their rights in Birmingham, Alabama, in 1963. Martin Luther King, Jr., is among this nation’s bravest political leaders, and few men or women are as worthy of a day in their honor as is King. This is because it really takes some time to appreciate the man—not only his accomplishments, but his audacity, because it was that which made him a unique American icon. In 2008, it is almost impossible to imagine what King faced: the darkest part of America, its institutions of hate and violence, at their full strength. Of course, hate and violence will stalk man until he is killed off from the Earth, but King faced those demons at one of the unfortunate times when they are backed with the full faith and credit of the state. He did not flinch or waver; he did not cut a deal that set him up as part of the power structure. He knew he was right: that it is corrosive to the soul to hate because of nothing more than superficial differences; that if America was to continue to mean anything at all, it would have to stop treating black Americans like troublesome work-animals. We have done nearly everything to cheapen the word ‘hero’ in our culture; to get back to what it really means, King’s life is our best reference.